Born Roy Halston Frowick in 1932 in Des Moines, Iowa, the fashion designer who went as simply 'Halston' moved to Chicago in 1952 where he took a job as a window dresser for the Carson Pirie Scott department store. In 1958, he moves to New York to work for the preeminate milliner Lilly Daché before taking a job designing millinery for Bergdorf Goodman. 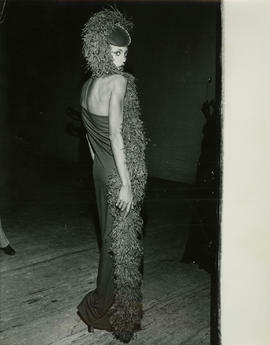 In 1966, Bergdorf Goodman sponsored Halston's first ready-to-wear clothing line which had its own boutique within the store. He leaves Bergdorf in 1967 and launches his own line the following year which was an immediate success; he won COTY Awards in 1969, 1971 and 1972. In 1973, Halston signs licensing deals with Norton Simon. Halston and menswear lines were launched in 1975. Diffusion lines were launched with J.C. Penny's in 1983 and the following year, Halston unsuccessfully attempts to buy his company back from Norton Simon; Halston Originals closes in 1985 and the following year Haston receives the news he is HIV positive. He passes away from AIDS related complications in 1990. This collections is comprised of seventeen (17) 18x16" black and white framed photographs by Bill Cunninham taken at the Grand Divertissement à Versailles in 1973. Persons featured in photographs include Marisa Berenson, Karen Bjornson, Alva Chinn, Dennis Christopher, Pat Cleveland, Bill Dugan, Heidi Lieberfarb, China Machado, Nancy North, Chris Royer, Ramona Saunders, and Andy Warhol. Also included in the collection are twenty-five (25) 17 x 11" original marker sketches by Halston and a program for the Grand Divertissement à Versailles.